Germany’s Fresenius Medical Care AG said on Friday it has bought an 85% stake in Indian dialysis services company Sandor Nephro Services Pvt. Ltd, which runs the Sparsh Nephrocare chain, from a group of investors. Fresenius, the world’s largest provider of products and services for renal diseases, didn’t disclose financial terms of the deal. It, however, said that Sparsh Nephrocare is likely to generate revenue of around $3 million (Rs 20 crore) in 2016. The deal marks a quick exit for Tata Capital Healthcare Fund that had invested in the Hyderabad-based company two years ago. The investment firm had put Rs 20 crore to buy a 26% stake in Sparsh Nephrocare, valuing the firm at Rs 77 crore, according to a person privy to the development. Sparsh Nephrocare was founded by IIT Bombay graduates Saurav Panda and Gaurav Porwal along with Rajeev Sindhi in 2010. The founders will retain a 15% stake in the company, said the person, who didn’t wish to be named. 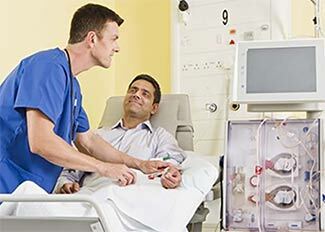 The dialysis chain has about 50 centres in smaller cities and towns in 12 states. The company follows an asset-light business model that involves starting dialysis centres within established hospitals, rather than setting up its own standalone centres from the ground up. The market for dialysis treatment in India is dominated by small, local players and there are only a handful of national players. Consulting firm Pacific Bridge Medical said in a 2013 report that the size of the Indian dialysis market rose to about $150 million in 2012 from $100 million in 2007. It estimated that the market was growing at 31% annually in India, compared with 6% in the US. The dialysis market came into focus this year after the central government, in the Union budget in February, announced a National Dialysis Services Programme to ensure dialysis centres in every district. Buoyed by the government's announcement, Aseem Garg, founder and CEO of DCDC Health Services Pvt. Ltd, which runs dialysis centres under its brand Deep Chand Dialysis Centre, recently told VCCircle about its expansion plans. The company also said that it had engaged a banker for its Series B round of funding to finance its expansion. In August, another dialysis firm, NephroPlus Health Services Pvt. Ltd, said it had raised Rs 100 crore (nearly $15 million) from private equity firm SeaLink Capital Partners and existing investor International Finance Corporation in a Series C round of fundraise for expansion. A unit of the billionaire US investor Warren Buffett-backed DaVita HealthCare Partners Inc as well as multi-specialty chains such as Fortis Healthcare and Apollo Hospitals also operate in this segment. Fresenius Medical Care provides dialysis treatments for 294,043 patients around the globe through its network of 3,432 dialysis clinics. 7i Capital Advisors acted as the exclusive sell-side adviser on this transaction.